Today I thought I would share ten things that I am loving right now. A few of them are new discoveries and a few not so new but I thought I would share anyway! Enjoy! 1. I do love a good home decorating book. The Kinfolk Home was just recently released and I've been loving browsing it's beautiful pages. The simplicity, style, and emphasis Nathan Williams puts on slow living captivates me. As Nathan states at the beginning of the book, "Slow living isn't about determining how little we can live with - it's about working out what we simply can't live without." 2. I'm a girl through and through and what girl doesn't love a good lip color and balm? These ones from Anthropologie are fantastic. Albeit lipsticks come in an assortment of beautiful colors and I love their vintage gold outer shell. They remind me of lipsticks my grandmother would carry in her clutch to church on Sunday. Smith's lip balm comes in various flavors and packaging. Anthro no longer carries it but you can find it in several stores online. Smith's lip balm has a myriad of uses. It aids in the relief of chapped skin, diaper rash, blemishes, detergent burns, rough cuticles, and to soften rough hands, so it's basically like carrying a little first aid tin in your purse. 3. Community. It's such a beautiful thing. One of the main things I love about my church is the community of believers that live out daily life together. It is not uncommon for me to get a text from a friend throughout the week wanting to meet for coffee, go to lunch, or go shopping together. We have a missional community that meets together every week and eats dinner together, discusses the sermon on Sunday, fellowship, and pray together. Our missional community is made up of mainly college students and I count it such a joy to be apart of their lives at such a crucial stage. We are hoping to do some college outreach soon to get even more students involved. I have another group of girls I meet together with weekly to go through a book study together, hold each other accountable, and share the highs and lows of life with each other. 4. Which brings me to #4. I am currently going through John: A 12 Week Study (Knowing the Bible) by Justin Buzzard with my wonderful group of girls. It's been a great little study so far on the book of John and challenges me to study the Word and dive in deeper to this wonderful gospel. I love this series and would like to study more of them when I am finished with John. 5. Ok, lovers of period dramas everywhere: I have found a new favorite tv show! I discovered The Time In Between while browsing Netflix one day. If you don't mind reading subtitles than you have to give this show a go! I have not gotten more wrapped up in a television show in a long time. Set in Spain in the 1940's, a beautiful seamstress sews dresses for Nazi officers' wives while spying on them to get information to the British. Yes, please. Unfortunately, there was only one season created but it's a beautiful story to get lost in. The cinematography, costumes, characters, musical score...everything is perfecto! You're welcome. 6. Cooking. Yes, I never thought I would see the day when I actually enjoyed cooking but I am beginning to find some small satisfaction in it. 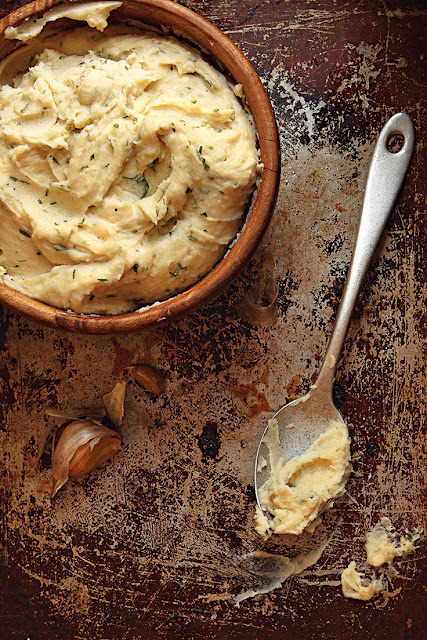 Now that I am at home full time I have a lot more freedom to search for delicious recipes and try my hand at new ones (like Julia Child's recipe for mashed potatoes pictured above). I can't wait to try that one. I made a John Wayne casserole for the first time the other night and Josh and I loved it. I thought I would share the recipe here. I have an entire collection of amazing recipes that I have either tried or can't wait to try on my Pinterest board here if you care to follow. Included in my collection is Julia's dish pictured above. 7. Marble. I have really loved seeing white marble all over my Pinterest feed. 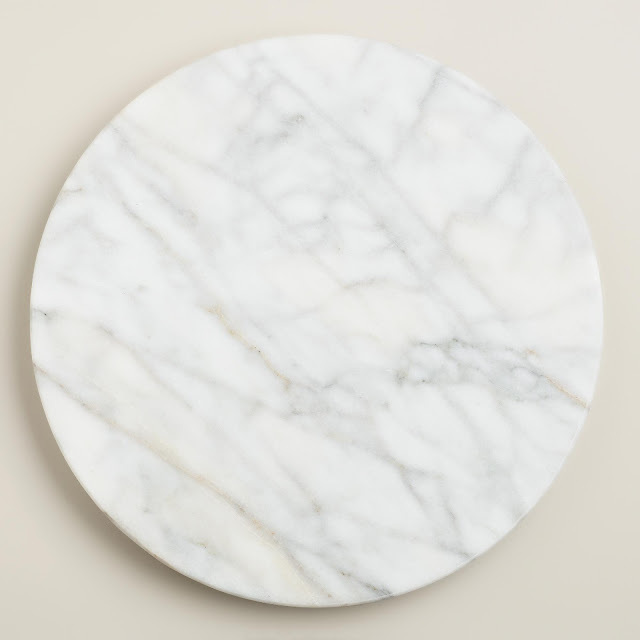 Marble utensil holders, marble countertops, faux marble iphone cases, and even marble-looking Apple computer covers. I purchased this marble lazy-susan for my dining room table a couple months ago and adore it! It is so sturdy, genuine marble, swivels perfectly, and looks lovely with a candle or vase of flowers displayed on top.I purchased it for a steal too at World Market. 8. 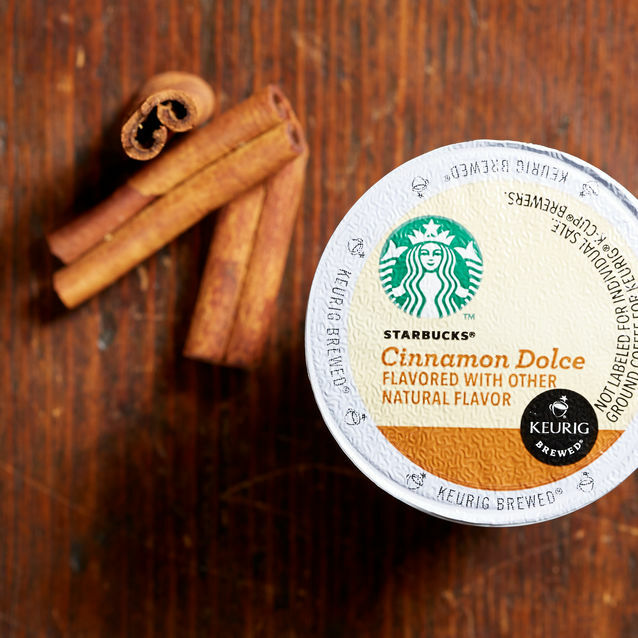 Starbucks' Cinnamon Dolce lattes have always been a favorite of mine so when I discovered they have them available in Keurig cups you could imagine my delight! It's hard for me to have just one a day but I am trying to ration them. They are THAT GOOD. 9. Capes, scarves, and cape scarves. I snagged this little beauty at a friend's yard sale last Saturday. Anthropologie and it still had the tags on it! I felt like I had won the lottery! I love it so much. I wore it to church on Sunday and I received numerous compliments on it. 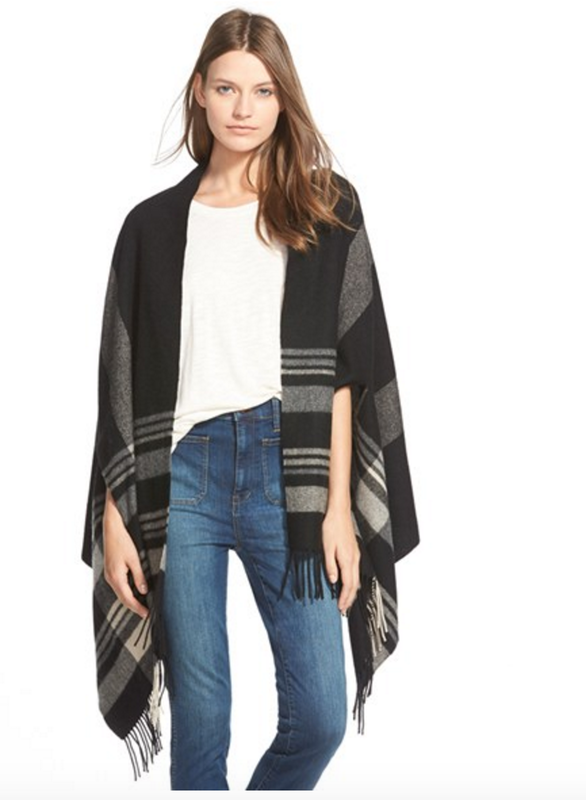 If you can go out in public wearing a gorgeous blanket around your shoulders, why not?? I have had my eye on this number and have asked for Madewell gifts cards for my birthday so maybe it will be mine soon! Get in my closet NOW! :) Here is another version pictured below. A cape (with pockets!!!) AND a scarf? Oh my. 10. 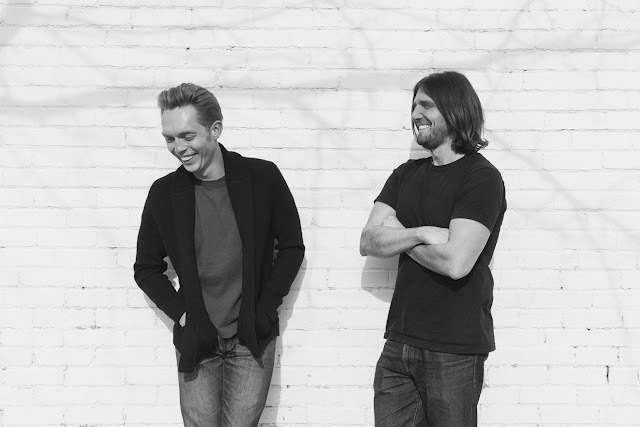 The Minimalists. I've discovered a new fascinating blog! How to live with less. I am an anti-hoarder to begin with so my poor husband when this is all said and done may have three shirts left to wear. No, in all seriousness, Josh and Ryan have inspired me to declutter my life and make room for only that which "brings joy and serves a purpose." I especially enjoyed reading their post on A Month of Minimalism. Great tips! One quote that I found on their blog stuck with me: "Never underestimate the importance of abandoning crap you don't need." I hope you enjoyed my ten things that I'm loving right now. I would love to hear what's making you smile or what exciting finds you've discovered as of late! Leave me a comment! I hope just maybe you saw or read something that inspired you a little bit or made you curious to try something new.